William Weber was on tour in Germany in the summer of 1931 when he chanced to meet a struggling politician, Adolf Hitler. Hitler soon discovered that Willy was a wealthy innocent and set out to exploit him in every way that he could. There follows a startlingly vivid exploration of inner life of this deeply evil man. In two volumes so richly detailed that they seem to have actually been created by somebody who lived through the events they depict, the private world of Adolf Hitler comes into focus in all its perversity and strangeness. Willy soon realizes that Hitler is a monster and resolves to use his extraordinary position as his friend to try to derail his plans. In the process, he becomes a invaluable British intelligence asset and an extremely vulnerable spy in Hitler’s House. He also meets and falls in love with Hitler’s ultra-secret mistress, Carlotta Krause, a Berlin prostitute who is a year younger than Willy and has known Hitler since she was a child. As their secret love affair explodes into great passion, they both must play roles in the weird fantasy life that Hitler successfully hid from history. In exploring the private life of Adolf Hitler, the story also by extension offers a warning to the world about such men, and a means of seeing beyond Hitler into the hidden lives and distorted psyches of many dictators and demagogues. 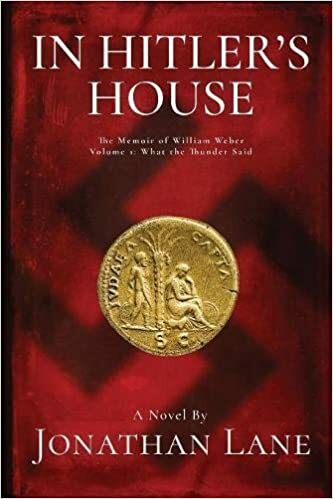 In Hitler’s House is the work of a pseudonymous history scholar, an expert on both modern European history and the history of the later Roman Empire. In Hitler’s House by Jonathan Lane is an interesting historical insight into men like Hitler. The lives of such evil men leaves behind a lot of questions. What makes them into such devils, are they like that 24/7, or do they have more hidden secrets than we were aware of? This book dives deep into all this and even goes much further. I found it intriguing. A historical that goes back to a deadly terror and showed more betrayal, deception, and other sides not commonly known to many. As a huge history fan, this caught my full-attention. Exploring into the lives of evil men and who they were really makes for an entertaining tale. One that can leave so many options. But it also opened up the lives of those close to Hitler himself. That’s where I got glued into this book. After reading some of it, I could not stop. I had to find out more. Overall, I would recommend this novel to all who love history, politics, and thrillers.